To avoid possible false allegations, contemporaneous notes should always be timestamped in a trusted note-taking system so that the writer can PROVE when they were written. This eliminates the allegation of ‘fake’ notes that were created “when needed”. 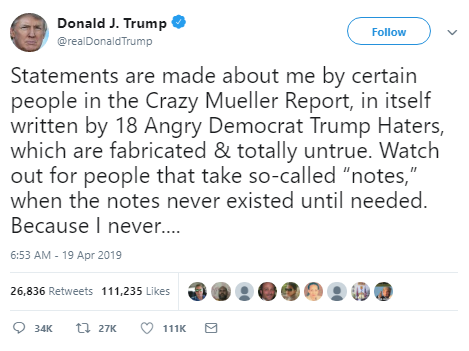 The key statement within this tweet is his claim that the “notes never existed until needed”. Can we determine when these “notes” were created? 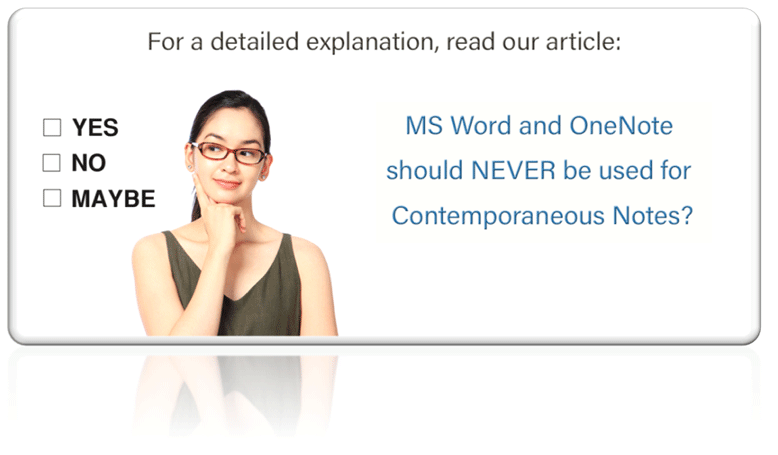 You may be surprised to learn that using popular word processing applications may leave this question unanswered. However, it would be very easy, if they were created in an immutable system like Forensic Notes! President Trump makes a valid and interesting point about contemporaneous notes and those that claim to have written them. Being able to independently verify when they wrote the note is a key component to their credibility. PROVING when you took good notes matters even more. This is why Forensic Notes was created. 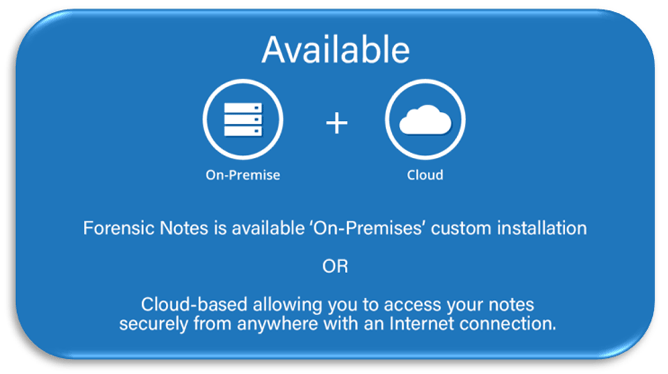 Forensic Notes allows you to create notes while ensuring you can always PROVE when you wrote them. From a technical perspective, every note is Digitally Signed and Timestamped, using the same technology used by major banks and government agencies. After you write a note, it is made immutable (can’t change) and it includes the date/time of when it was written. This is similar to the idea of placing the note on the blockchain, which is often in the news. And like the blockchain, anyone with a copy of your notes could simply drag & drop your notes on our verification page to confirm the notes were the originals and unaltered. As more information comes out on how these notes were written, we will see if the authors are able to PROVE when they were written. Perhaps they used Forensic Notes? Interested in protecting your credibility? Signup with Forensic Notes Today! It appears that you encountered an error. If you continue to encounter this error, please contact support. The Administrator of your Team Account has been notified. Once final approval has been granted, you will be sent an email advising you to log in. 1. Open the Forensic Note ZIP Archive (.zip) that you downloaded from your account. 2. 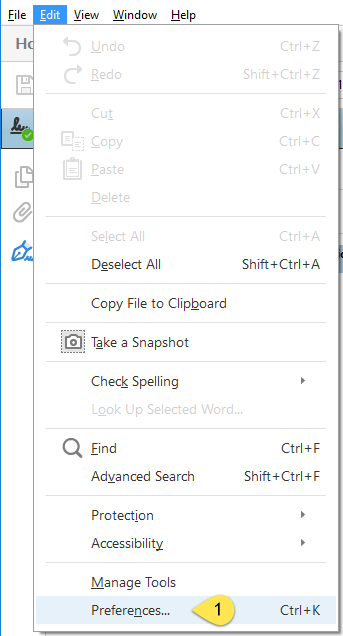 Open a File Explorer window and navigate to a folder to save your files. 3. Adjust both the File Explorer window and ZIP Archive window on your screen so that you can see both at the same time (you may need to adjust the size of each window). 4. 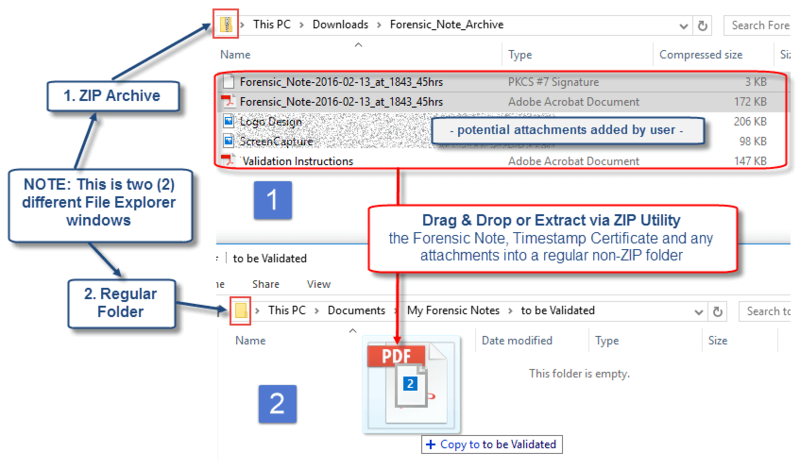 Select all files including the Forensic Note, Timestamp Certificate and attachment(s) within your ZIP Archive (.zip). 5. Drag & Drop the files from the ZIP Archive into the second (2nd) File Explorer window you opened in step 2. Files will automatically be extracted. NOTE: You will need to enter your ZIP Archive password when extracting the files. Once extracted, your files will NOT BE PASSWORD PROTECTED. Please ensure you’ve extracted the files to a secure folder that only you can access if your notes must remain private. We are happy to help with any questions you have regarding Forensic Notes. Kindly provide information below and we will get back to you as soon as possible. Adobe Reader / Acrobat Validation NOT Always Required! The instructions within this article are provided to validate a Forensic Note via Adobe Reader or Adobe Acrobat. However, validation via the Forensic Notes Proprietary Validation Tool is recommended due to its ease of use and validation capabilities. 1. 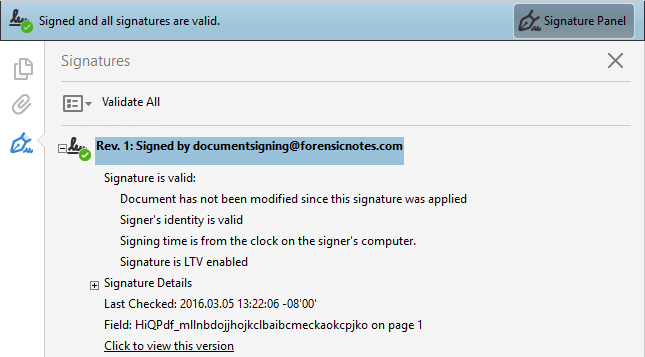 Open a Forensic Note / Notebook within Adobe Reader or Acrobat and ensure that the “Valid Forensic Note” signature panel is displayed (see below). If Digital Certificate has not been trusted, go to Trust Digital Signing Certificate and follow the instructions before proceeding. 3. 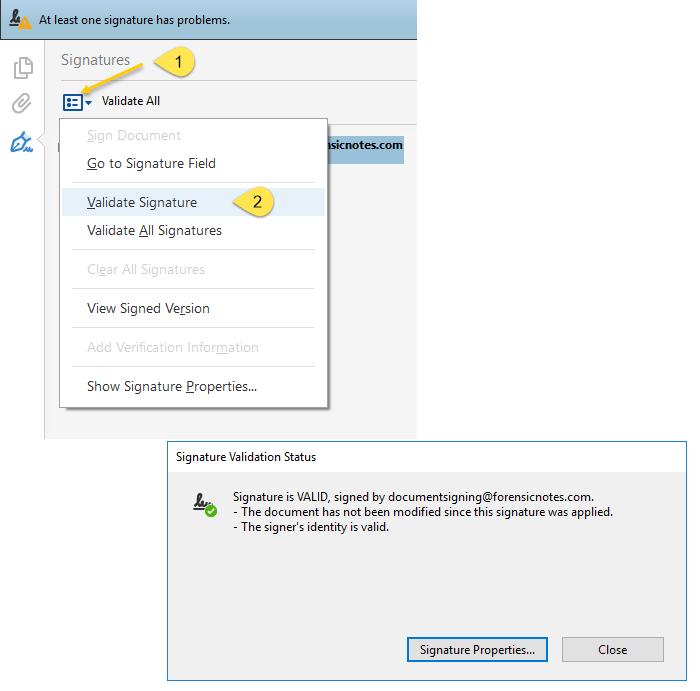 Confirm that the document has not been modified since the signature was applied. 4. Confirm that the signing time of the document approximately matches the time you have recorded within the Forensic Note or Forensic Notebook. 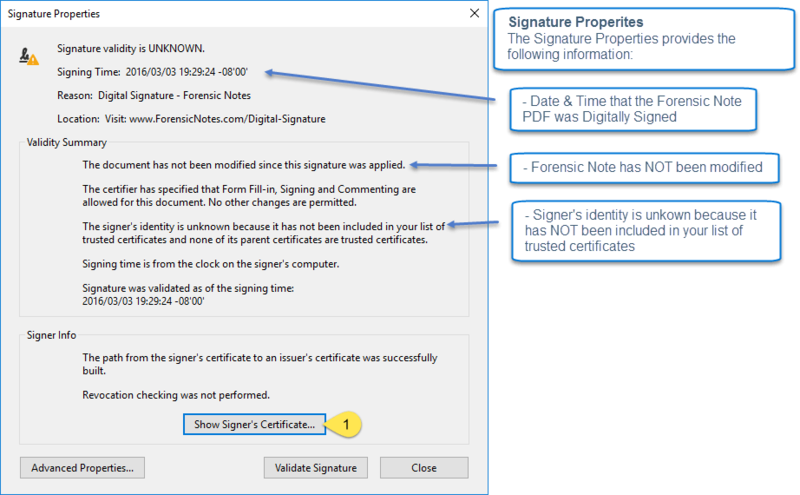 To view the signing time of the Forensic Note, you must “Show Signature Properties…”. Dates & Times – Why Approximately? Forensic Note information in saved read-only into the database. The date and time associated with saving the data into the Forensic Notes application is recorded and printed within the generated PDF. These three (3) steps are normally processed quickly resulting in minimal differences in times associated with all three steps. However, larger documents or heavy network utilization may result in longer delays between steps causing more significant time differences. As a result, times should approximately match within a couple minutes’ difference. 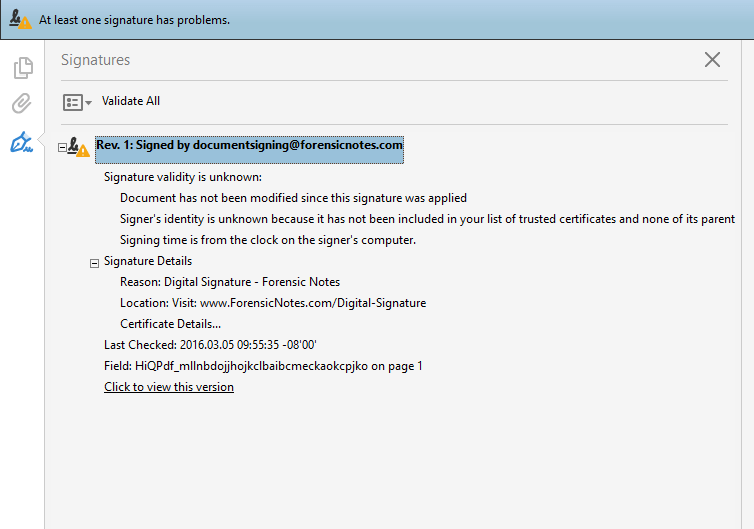 Each Forensic Note PDF has been Digitally Signed by DocumentSigning@ForensicNotes.com. 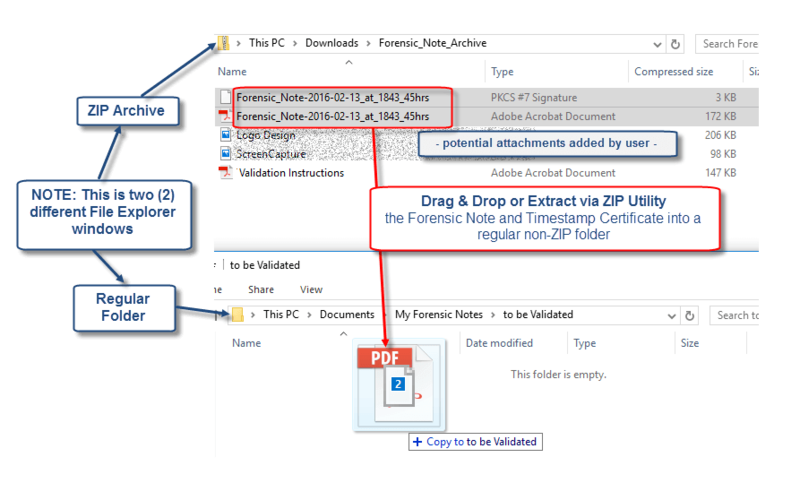 As a result, any attempts to change the Forensic Notes PDF will result in a warning to the user when the Forensic Note is viewed within Adobe Reader / Acrobat as shown below. The above warnings indicate that the Forensic Note was modified in some way since it was originally saved and signed within the Forensic Notes application. 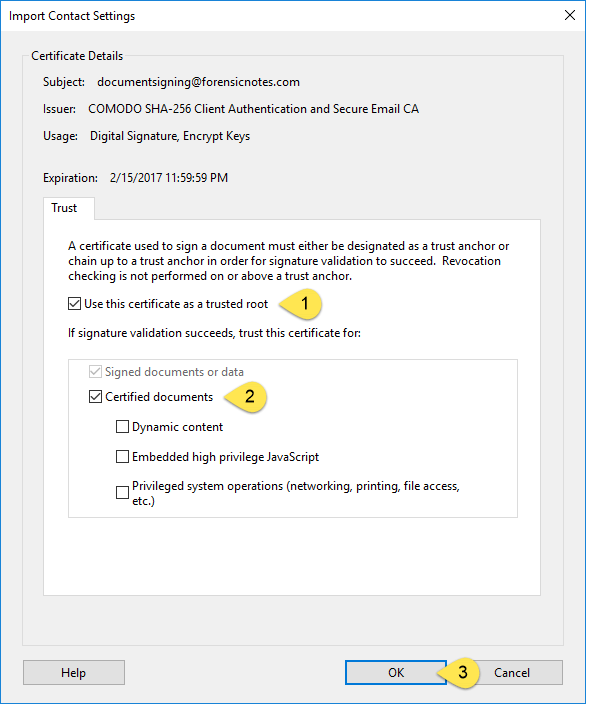 The certificate associated with the Digital Signature has not been trusted on the computer viewing the Forensic Note. This is expected when first viewing a Forensic Note on a computer for the first time. 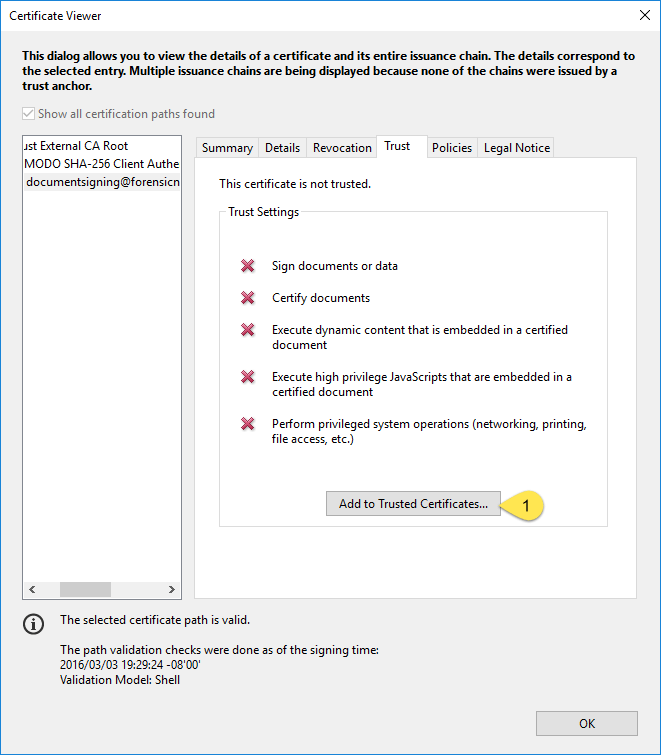 For steps on how to trust the Digital Certificate associated with the Digital Signature, go to How to Trust Digital Signing Certificate. Forensic Notes are timestamped by DigiStamp, an independent & trusted Timestamping Authority (TSA). 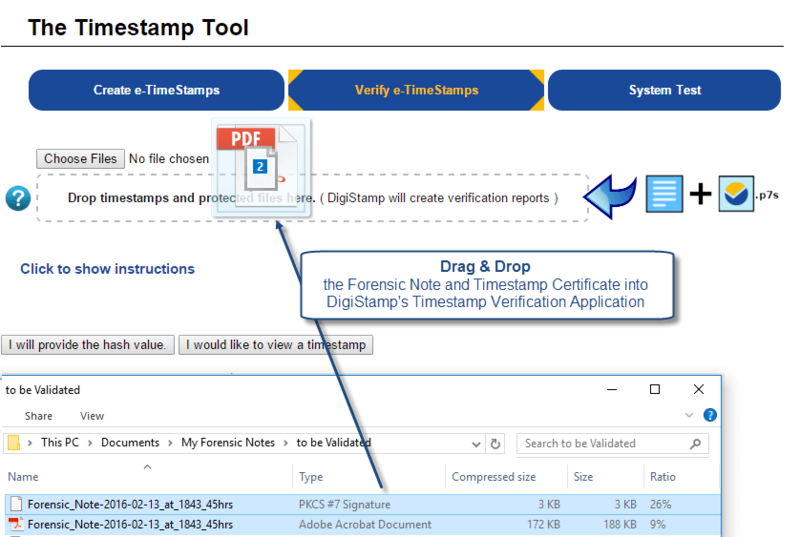 DigiStamps’ Timestamp Certificate (.p7s extension file) is used to verify the date and time of your Forensic Note if the validity of the Forensic Note is ever questioned. Timestamp Validation NOT Always Required! 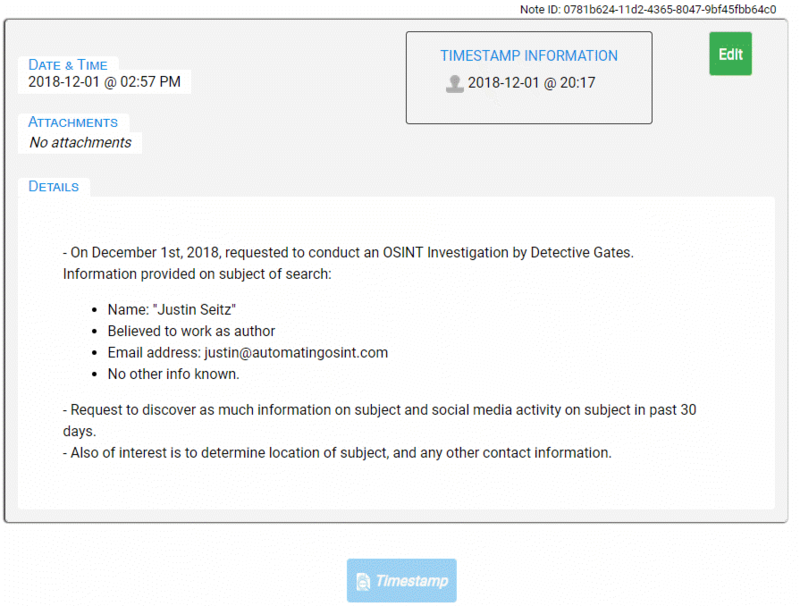 The instructions within this article are provided to validate a Forensic Note with the generated Timestamp Certificate. 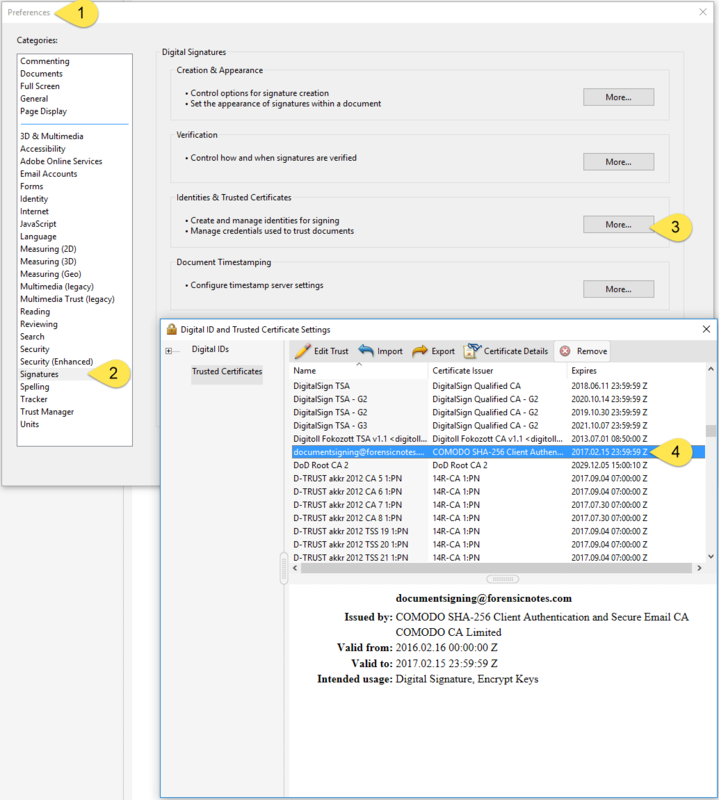 However, validation via timestamp should only occur if the validity of the Forensic Note is questioned as the steps below are more complex than using the Forensic Notes Proprietary Validation Tool. 5. Drag & Drop the files into the DigiStamp Timestamp Verification application or press the “Choose Files” button to select your files from within File Explorer. NOTE: Your personal information is not uploaded to the DigiStamp server. The following display confirms that the timestamp matches the Forensic Note. 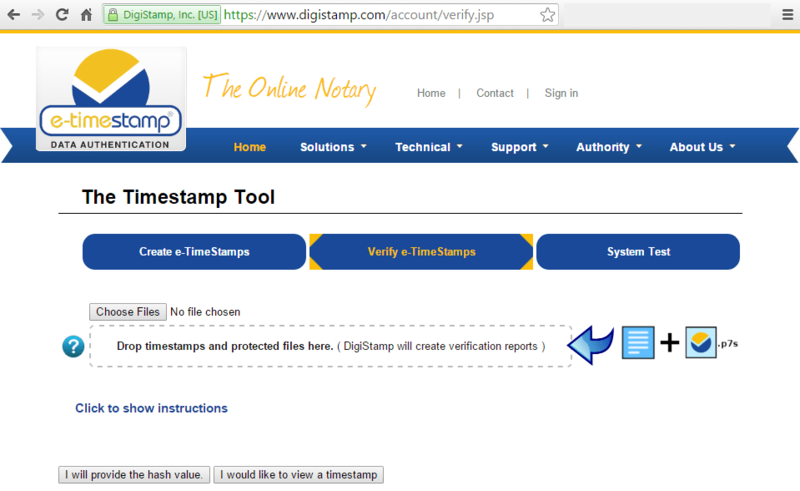 The date & time saved within the Timestamp Certificate is displayed within the DigiStamp confirmation application. Changing the filename of the Forensic Note or Timestamp Certificate has no effect on the validation process. Changing a filename does not change the contents of the file or its’ HASH value. The HASH (SHA-512) value is used to validate a file with an associated timestamp. Good to Know – UTC or GMT? All dates & times stored or displayed are in UTC (Universal Time Coordinated). Technically, UTC is a time standard whereas GMT is time zone. Both are often used interchangeably and represent the same time offset. The following shows that the Timestamp Certificate does not match the Forensic Note provided. If the filenames match but the following information is displayed, then this could be an indication that the Forensic Note has been altered in some way. 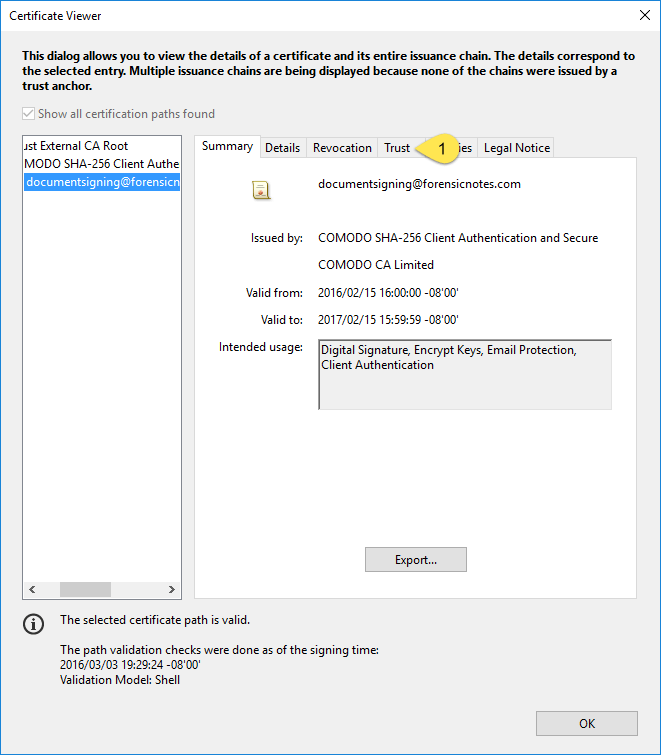 Every Forensic Note and Forensic Notebook is Digitally Signed by a Digital Signing Certificate issued by Comodo, a Certificate Authority (CA). 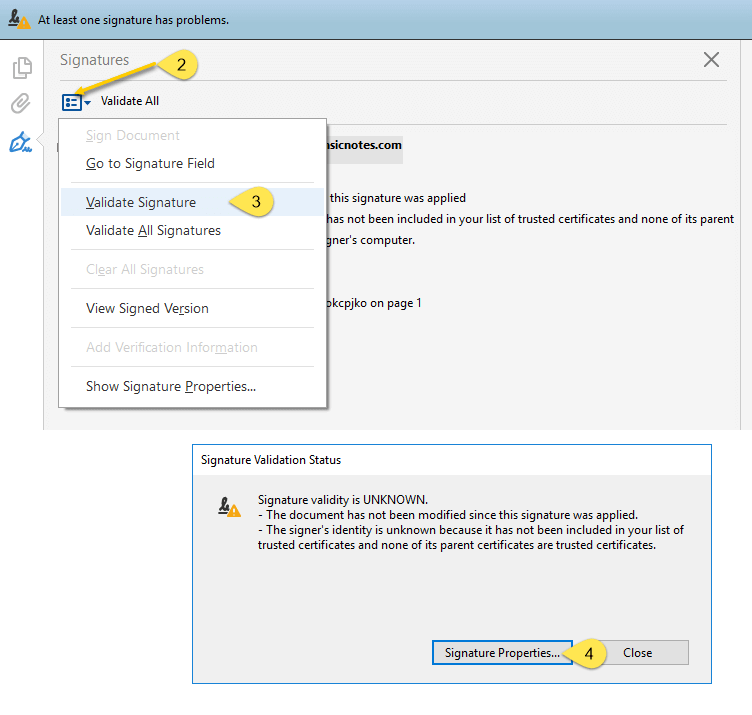 By default, Adobe Reader / Acrobat do not have knowledge of the certificate which results in the warning “At least one signature has problems” (as shown below). 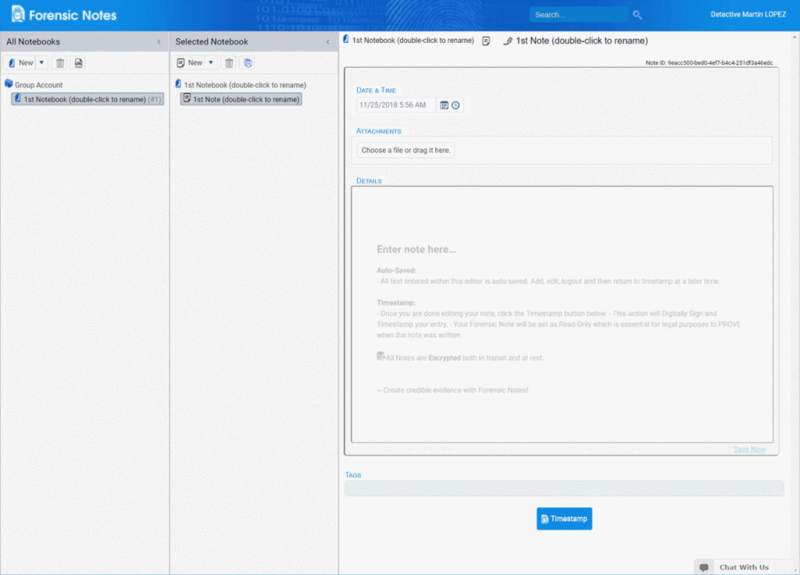 To properly validate your Forensic Notes and Forensic Notebooks, follow the steps outlined below which will add the Digital Signing Certificate to your list of Truststed Certificates. The following steps only need to be completed once on each computer viewing Forensic Notes and Notebooks. NOTE: The following instructions are for Adobe Acrobat Reader CS. Other versions of Adobe Acrobat will have similar features and options. The following menu shows the properties of the Digital Signature. As shown, the Forensic Note has not been modified since it was Digitally Signed. The following menu shows further information related to the Digital Certificate. The following menu shows that the associated Digital Certificate is not trusted. Now that the Digital Certificate is trusted within Adobe Reader/Acrobat, the Forensic Note or Notebook must be re-validated as it will continue to show errors until completed. The Digital Signature will be re-validated now that the Digital Certificate is trusted. Forensic Notes allows you to validate the authenticity of notes and attachments by physical file or by providing a SHA-512 Hash. 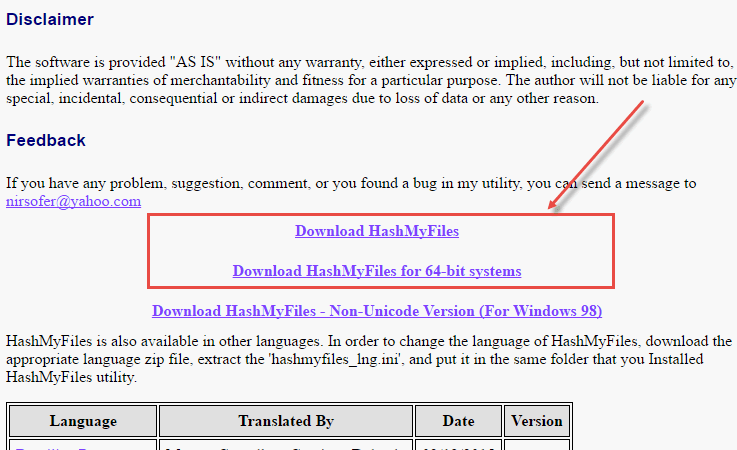 To determine the SHA-512 Hash of your physical file, we suggest you download the following tool. Although it looks a bit ‘dated’, it is one of the easier to use applications for this purpose. 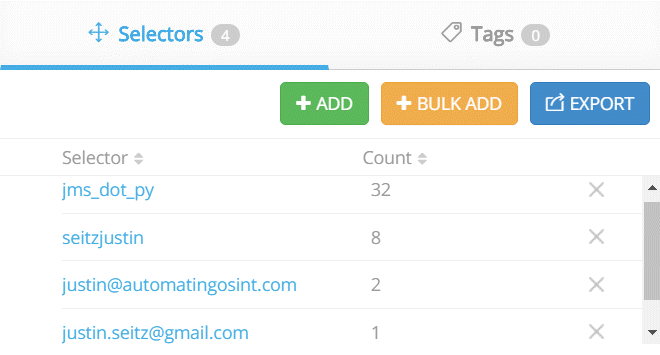 Download links can be found near the bottom of the page. What is an Electronic Sigature (eSignature)? Electronic signatures (eSignatures) are the equivalent of a handwritten signature in the paper world. In simple terms, an electronic signature is simply a digital image of a signature displayed within an electronic document. Digital signatures strengthen electronic signatures by encrypting the contents of a document which allows applications to detect if the document was tampered with or altered. Although digital signatures appear to be complicated, the knowledge required to use and validate digitally signed documents associated with Forensic Notes is minimal. For most people using Forensic Notes, the above information is all that is needed to understand the Digital Signing process. Forensic Notes Proprietary Validation Tool will complete the complex validation and simply display the validity of the document as either being Valid (Green) or Invalid (Red). Click here for further information on the differences between Electronic Signatures and Digital Signatures. The digital signature relies on a digital fingerprint which is a SHA-512 Hash value. The Hash value is calculated using a one-way encryption algorithm which generates the unique value for the document. The only way to generate a duplicate SHA-512 Hash value is if an exact duplicate file is analyzed. The digital fingerprint is then encrypted with a Private Key through a process involving Public Key Infrastructure (PKI). As part of the Digital Signing process utilized by Forensic Notes, an independent digital timestamp is obtained from DigiStamp, our Timstamping Authority (TSA). DigiStamp is trusted by large banks, government agencies and global organizations. The digital timestamp is embedded within the Digital Signature at the time of signing. This allows the person viewing the document to know the exact data and time the document was digitally signed. The result is an electronic document that is designed to detect tampering and modifications. If any modification or tampering of the document occurs, the signature becomes invalid and will fail to validate using Forensic Notes Proprietary Validation Tool. In addition, the digital signature can be checked and validated within Adobe Reader or Adobe Acrobat. Digital Signature – What does it mean for you? 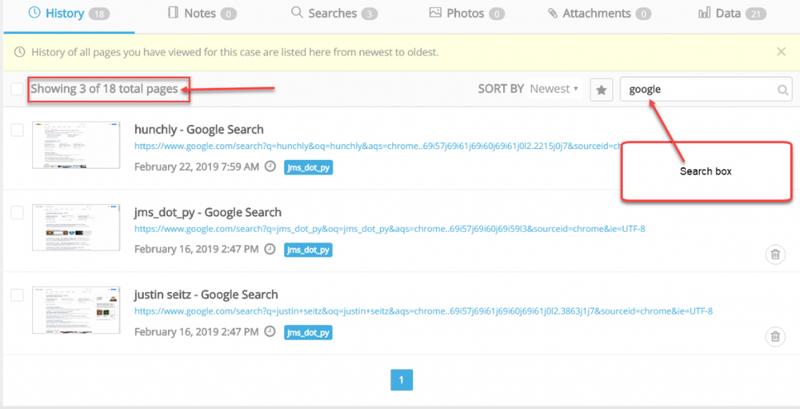 From a legal perspective, this allows the creator of the Forensic Note to prove that a note or attached document existed at the date and time specified. Not only can the owner prove that the note or attachment existed, but also that it has not been modified or altered since the signature was applied. This is vital for admitting documents into a court room – as there may be challenges about the reliability of your documents and the time they were actually written. Can you PROVE when you created a note or document? The result will be a document that appears to have been created in the past. Although it may be possible for an experienced digital forensic examiner to determine the original date, the process to do so is both difficult and time consuming. Digital Signatures and Forensic Notes Proprietary Validation Tool solves the problem of being unable to prove when a document was saved. This ensures that the author of each Forensic Note can easily PROVE when a note or document was created. As a result, you will be able to present your notes and documents and face any scrutiny with credibility and integrity. 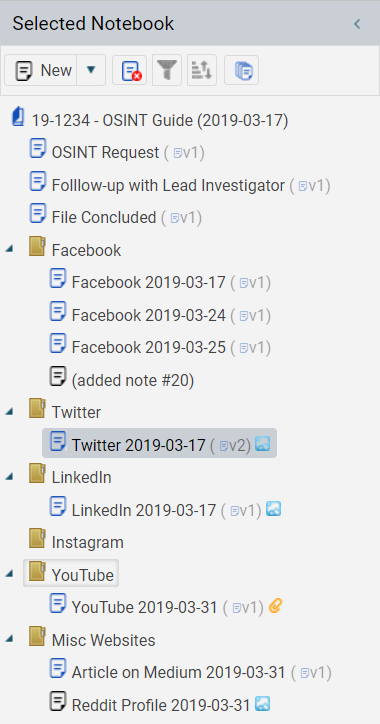 The proprietary Validation Tool below will allow you to prove the date that your Forensic Notebook, Individual Forensic Notes, and Attachments were written and confirm that they have not been modified since they were saved within Forensic Notes. Below are three (3) files you can use to test the validation system. Forensic Notebook (Valid) — Right click, Save link As.. 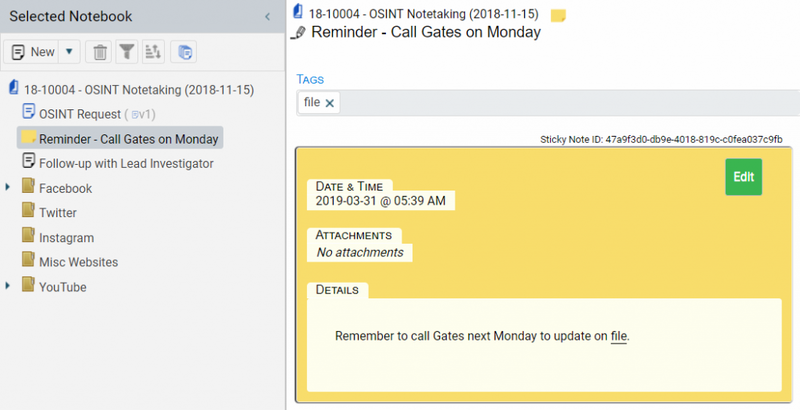 The following Notebook is Valid, but additional change(s) were made to the electronic version of the Notebook within the Forensic Notes application which results in the following Forensic Notebook being valid, but outdated (Yellow). Changes may include the user adding a new Forensic Note or marking an existing Forensic Note as deleted. FACT: This is similar to Photocopying the notes within a paper notebook, but then adding a new note to the paper notebook afterwards. The existing photocopy is valid; it just doesn’t include all the information currently contained within the paper notebook which could be essential to your particular incident. Forensic Notebook (Valid but Older Outdated) — Right click, Save link As.. The following Notebook was modified within Adobe Reader and is therefore NOT valid. 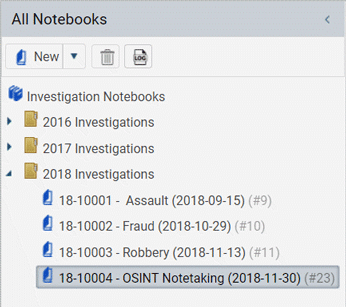 Forensic Notebook (INVALID – Changes made to document) — Right click, Save link As..
We get that a lot of people don’t get excited about note-taking, but for us, it has become a passion and a fundamental part of our daily lives. Hopefully our story will inspire you to look deeper into your documentation strategies, whether it’s for your business, organization, or personal life. The story of Forensic Notes is born out of the frustration of trying to keep great notes in a field were note-taking is essential – Digital Forensics. Ironically, in a field of high-technology, we were initially taking hand-written notes. We quickly found ourselves frustrated, however, with trying to keep track of (or misplacing) notes for multiple ongoing investigations. Not only was it hard to keep track of our notes, trying to read our own writing or recording long strings of digital data by hand was both tedious and tiresome. It didn’t take us long to make the switch to using electronic notes using popular word processing and spreadsheet applications. We immediately enjoyed the convenience of being able to read our own writing, spell-checking, searching key-terms, and being able to copy & paste data and images directly into our notes. However, we started to get a nagging feeling that something was wrong with our method. We had been trained in the strict rules of note-keeping when it came to pen & paper, which are focused on ensuring contemporaneous notes cannot be created or altered after the fact. But to our surprise, there were no real rules or Standard Operating Procedures (SOPs) for keeping digital notes. And because we were working in the field of digital forensics, we realized how easy it would be to alter these key electronic documents with no easy or reliable method to identify or track such changes. Then we started to get worried. If our electronic notes were not accepted in court, then obviously all our hard work was for nothing. What if we could build an electronic note-taking application that followed and mimicked the strict rules of the pen and paper? And this was the birth of Forensic Notes. Our initial goal was simple, replicate the benefits of a physical notebook while allowing access to the technological conveniences available in a digital format. We already achieved our initial goal and many more. But our story is far from over! We are still making notes, and looking for ways to make the process easier, faster, and more accessible for the various ways other people want to make their notes. And that’s Forensics Notes in a nutshell. Want to know more about the product and the people who make up the Forensic Notes Team? 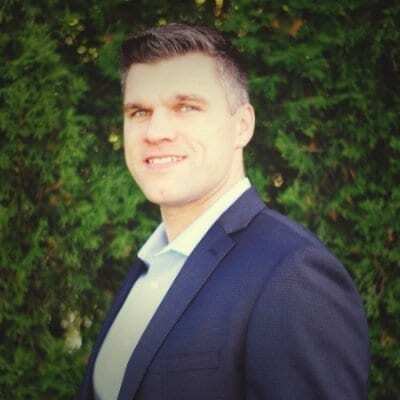 Robert Merriott has been a municipal police officer for over 12 years working as a frontline police officer, tactical operator, and most recently as a detective in the Technological Crime Unit specializing in Digital Forensics and Cybercrime. As a result of his policing and private sector work experience, Robert understands the threats and liabilities faced by organizations with an online presence as well as the challenges faced by police agencies in investigating and preventing crimes. Mike Post has a degree in Behavioral Science and began his career working in education overseas. After returning home, Mike moved his skills into Law Enforcement where he worked as a frontline police officer, an Open-Source Intelligence (OSINT) investigator, and then as a Digital Forensic Examiner. Mike has earned several certifications including CompTIA’s Network+. John Pyper has a degree in Applied Science and worked as an Engineer for 9 years before moving his skills to Law Enforcement in 2001. As a police officer, John has worked over 10 years as a detective in the fields of Digital Forensics and Cybercrime. John has worked on hundreds of investigations and examined over a thousand exhibits. John has presented evidence at various levels of the justice system including Supreme Court where he has been qualified as an expert in the field of digital forensics. 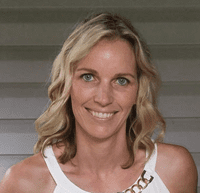 Kimberly Owen is a caring professional dedicated to helping Forensic Notes clients succeed. Prior to joining Forensic Notes, Kimberly worked within the airline industry as an inflight manager travelling around the globe. Recently, she took time off to start a family which has resulted in four wonderful children. Kimberly excels in 1-on-1 interactions with clients due to her sincerity and sarcastic demeanor.